We talked about the Zenith Academy Christophe Colomb Hurricane last February. 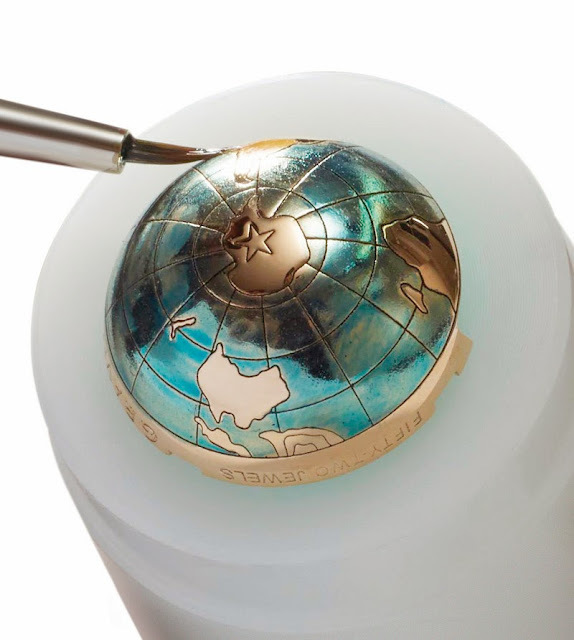 Zenith is now presenting the Academy Christophe Colomb Hurricane Grand Voyage, a 10-piece limited edition of that extraordinary timepiece which adds to an impressive movement a hand-made decoration - created using techniques such enamelling, engraving and micro-painting - that is a true work of art. In order to achieve the result that you can admire in the pictures below, Zenith watchmakers had to rework the movement in order to accommodate the ornamental elements within the same 45 mm-diameter case in rose gold while making no compromises on precision and reliability. On the dial side, Zenith maintains an open architecture which allows us to admire its three original mechanisms in action: the barrel with its fusée and chain transmission (at 10.30 and 1.30), the gyroscopic gravity control system, and the high-frequency regulating organ at 6 o’clock. 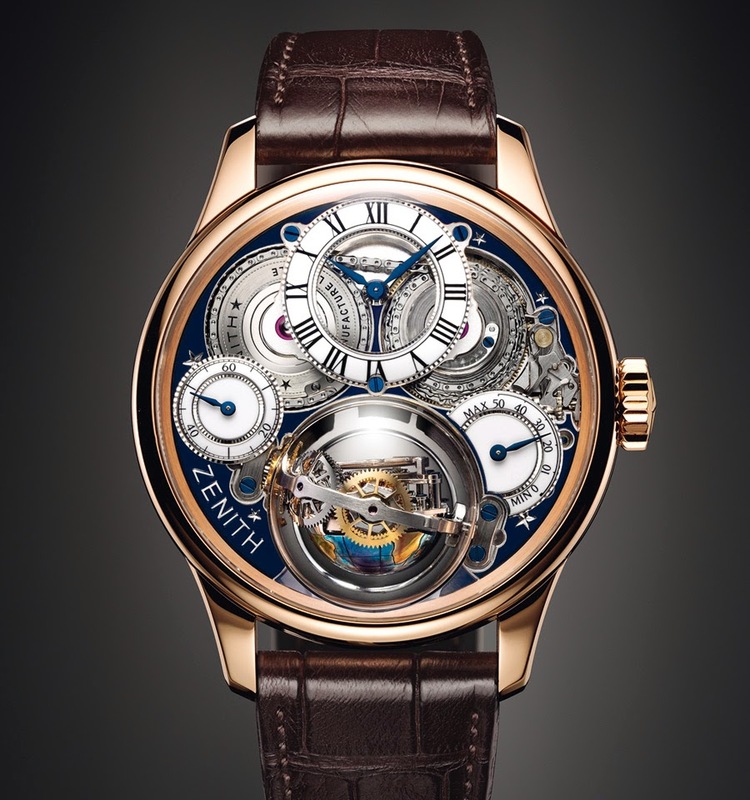 The three gold subdials (hours/minutes at 12 o’clock, small seconds at 9 o’clock, power reserve at 4 o’clock) are finely guilloché, enamelled in white and fitted with blued steel hands. The plate has been entirely hollowed out by hand so as to leave only the Zenith logo and a flurry of stars standing out in relief; and the troughs thus created have been filled with midnight blue lacquer. 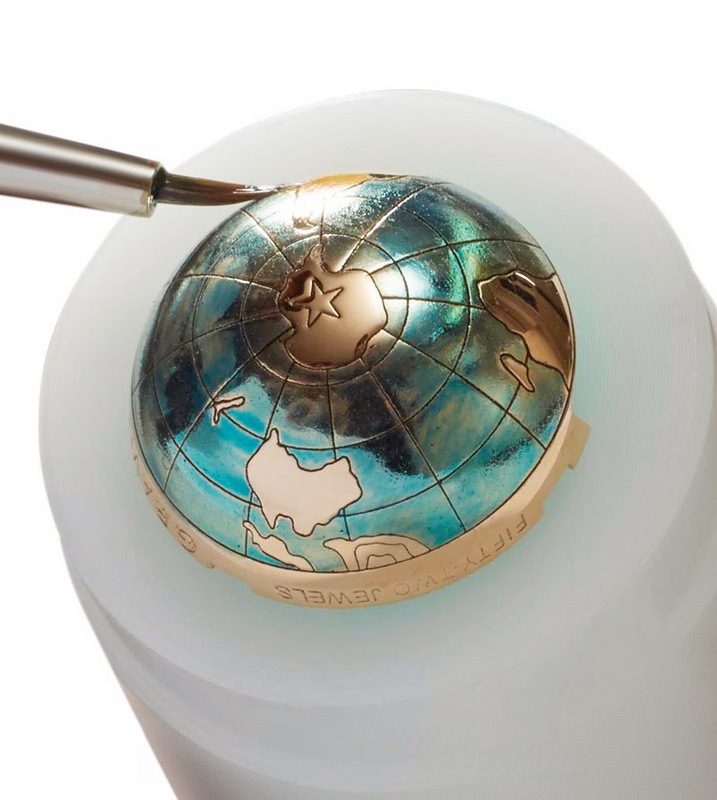 The counterweight of the gravity control system is now adorned with a micro-painted depiction of the Southern hemisphere. 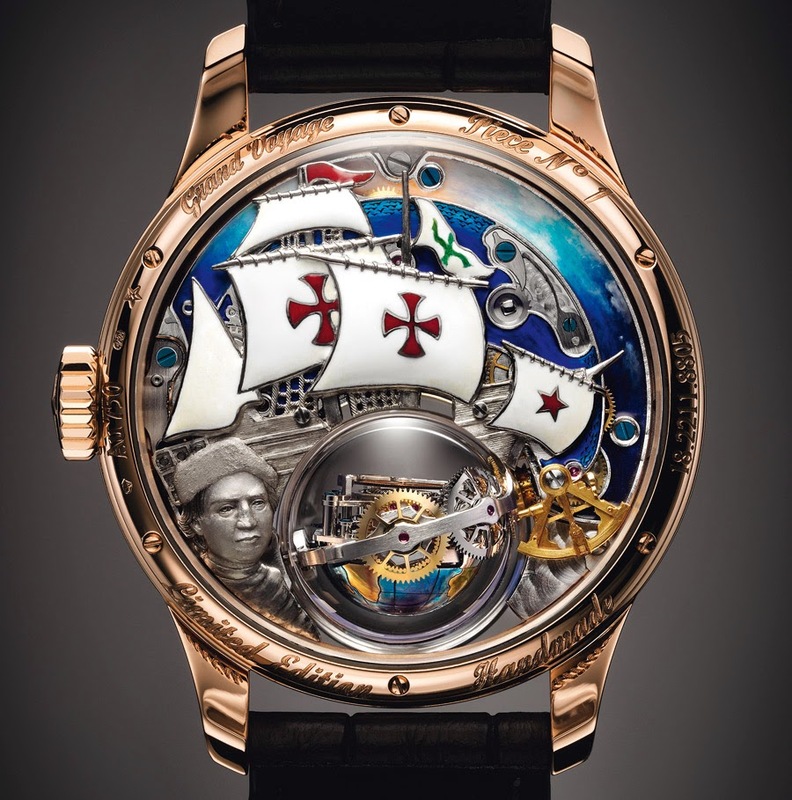 The back of the Academy Christophe Colomb Hurricane Grand Voyage may leave you speechless. The miniature painting was created by using a sophisticated system of gold appliques fixed directly on the movement. 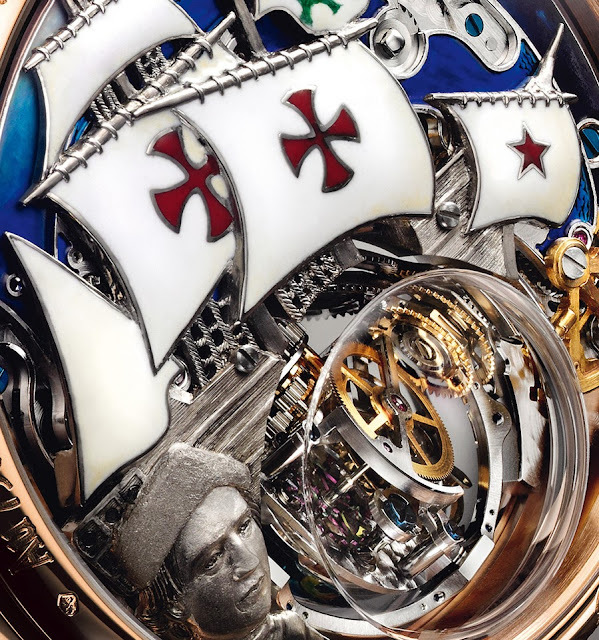 In the foreground it is possible to admire the finely engraved portrait of Christopher Columbus along with a sextant, the astronomical instrument serving to calculate longitude. The background is dominated by a reproduction of the Santa Maria, the flagship with which Columbus sailed on his first voyage in 1492. The sails, crafted in enamel on a cloisonné base using an engraved champlevé technique, are adorned with the famous red cross except for one which displays Zenith’s famous guiding star. 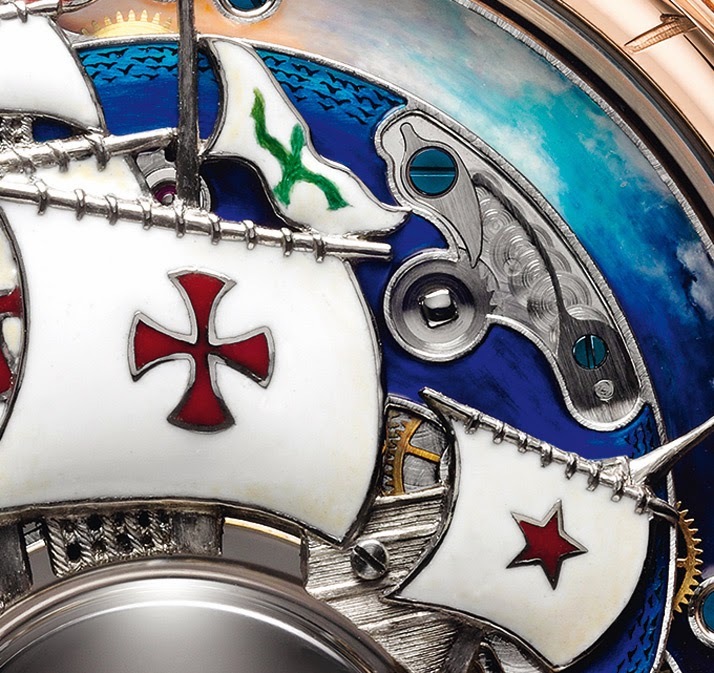 Behind the sailboat, the going-train bridge is engraved with tiny waves and coated with a layer of translucent lacquer to represent the ocean while the micro-painting on the barrel bridge depicts the sky. Integrating this decoration called for several challenges including finding points to which the applique elements could be fixed, while reducing the movement thickness and the spaces between the calibre and the ornamentation to an absolute minimum - less than a tenth of a millimetre beneath the sails. The chronometric precision is guaranteed by three main feats: a regulating organ with a high oscillating frequency (36,000 vibrations per hour) for dividing time into tenths of a second; a fusée and chain transmission system compensating for the inevitable variations in the force of a barrel while it is unwinding; and a patented gravity control module serving to neutralise the effects of gravity on the rate of a watch. 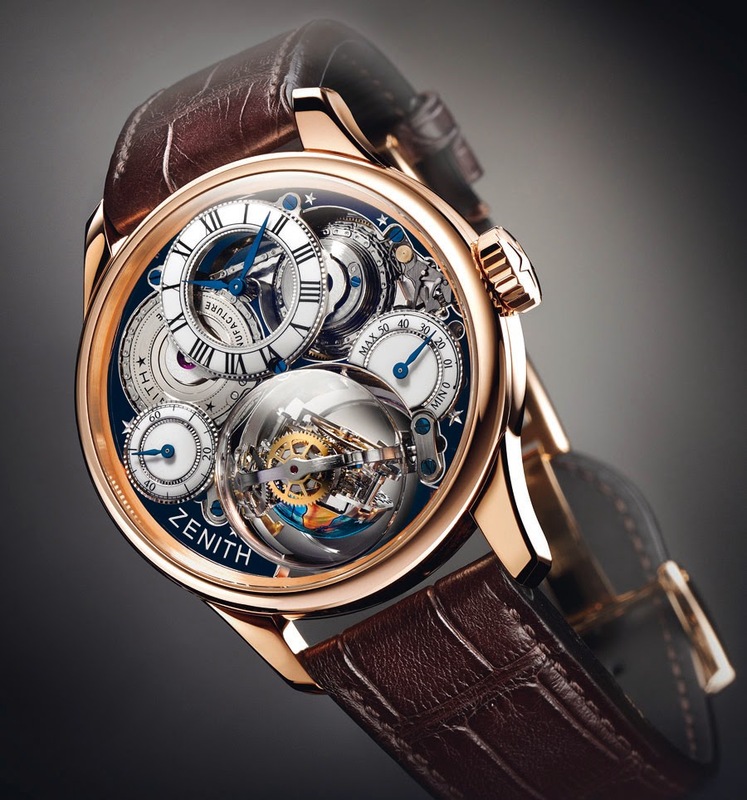 Zenith presented the Academy Christophe Colomb Hurricane Grand Voyage, a 10-piece limited edition which adds to an impressive movement a hand-made decoration - created using techniques such enamelling, engraving and micro-painting - that is a true work of art.